To be stripped of one's security clearance is to be stripped of one's nationality. It is a statement by those who see themselves as the official definers of loyalty and patriotism that a person does not meet the mark: cannot be trusted to be a loyal American. Too often, the definers of loyalty define a patriot as one who is exactly like them: white, christian, straight, narrow-minded, bigotted and frequently appallingly ignorant of the most basic principles on which the United States of America was founded. So each year, on Veterans' Day, CFSO likes to highlight American Veterans - American Patriots - who are as different from the definers of loyalty as diamonds are from dog manure. This year, we salute the 442nd Infantry Regimental Combat Team, the fighting "Budda Heads." 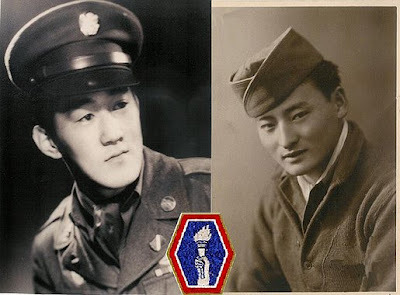 The Budda Heads, the most decorated fighting unit in the history of the American Armed Forces, was composed of Americans of Japanese descent, who fought for the United States in a war in which Japan was a leader of the enemy forces. By the standards of today's Bureau of Diplomatic security as administered by its current staff, not one of them would have received a security clearance. The 442nd Infantry, formerly the 442nd Regimental Combat Team(RCT)of the United States Army, was self-sufficient fighting force, fighting with distinction in Italy, southern France, and Germany. The unit became the most highly decorated regiment in the history of the United States Armed Forces, including 21 Medal of Honor recipients. 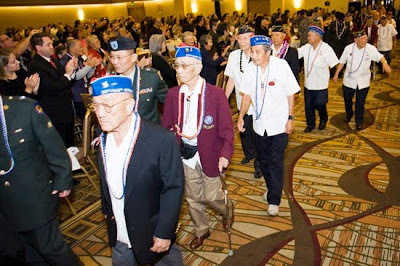 Most Japanese Americans who fought in WWII were Nisei, Japanese Americans born in the U.S. Nevertheless, shortly after the Japanese attack on Pearl Harbor on December 7, 1941, Japanese American men were categorized as 4C (enemy alien) and therefore non-draftable. On February 19, 1942, President Franklin D. Roosevelt signed Executive Order 9066, authorizing military authorities “to prescribe military areas in such places and of such extent as he or the appropriate Military Commander may determine, from which any or all persons may be excluded, and with respect to which, the right of any person to enter, remain in, or leave shall be subject to whatever restrictions the Secretary of War or the appropriate Military Commander may impose in his discretion.” Although the order did not refer specifically to people of Japanese ancestry, it set the stage for the internment of people of Japanese descent, including many relatives and family members of the men in the 442nd. In March 1942, Lieutenant General John L. DeWitt, head of the Western Defense Command, issued the first of 108 military proclamations that resulted in the forced removal of more than 110,000 people of Japanese ancestry on the West Coast from their homes and placed in guarded concentration camps behind barbed wire, or (as the government euphemistically referred to them) relocation camps. In Hawaii, martial law, complete with curfews and blackouts, was imposed. A large portion of the population was of Japanese descent (150,000 out of 400,000 people in 1937) and internment was deemed not practicable, mostly for economic reasons. When the War Department called for the removal of all soldiers of Japanese ancestry from active service in early 1942, General Delos C. Emmons, commander of the U.S. Army in Hawaii, decided to discharge those in the Hawaii Territorial Guard, which was composed mainly of ROTC students from the University of Hawaii. However, he kept the more than 1,300 Japanese American soldiers of the 298th and 299th Infantry regiments of the Hawaii National Guard. Despite this, the discharged members of the Hawaii Territorial Guard petitioned General Emmons to allow them to assist in the war effort. The petition was granted and they formed a group called the Varsity Victory Volunteers, which performed various construction jobs for the military. General Emmons, worried about the loyalty of Japanese American soldiers in the event of a Japanese invasion, recommended to the War Department that those in the 298th and 299th regiments be organized into a “Hawaiian Provisional Battalion” and sent to the mainland. The move was authorized, and on June 5, 1942, the Hawaiian Provisional Battalion set sail for training. They landed at Oakland, California on June 10, 1942 and two days later were sent to Camp McCoy, Wisconsin. On June 15, 1942, the battalion was designated the 100th Infantry Battalion (Separate)—the “One Puka Puka”. As a regimental combat team, the 442nd RCT was a self-sufficient fighting formation of three infantry battalions (originally 1st, 2nd, and 3rd Battalions, 442nd Infantry, and later the 100th Infantry Battalion in place of the 1st), the 522nd Field Artillery Battalion, the 232nd Engineer Company, an anti-tank company, cannon company, service company, medical detachment, headquarters companies, and the 206th Army Band. Although they were permitted to volunteer to fight, Americans of Japanese ancestry were generally forbidden to fight in combat in the Pacific Theater. No such limitations were placed on Americans of German or Italian ancestry who fought against the Axis Powers in the European Theater, mostly due to practicality, as there were many more German and Italian Americans compared to Japanese Americans. However, many men deemed proficient enough in the Japanese language were approached, or sometimes ordered, to join the Military Intelligence Service (MIS) to serve as translators/interpreters and spies in the Pacific, as well as in the China Burma India Theater. These men were sent to the MIS Language School at Camp Savage, Minnesota to improve their language skills and receive training in military intelligence. The 442nd Combat Team, minus its 1st Battalion, which had remained in the U.S. to train Nisei replacements, sailed from Hampton Roads, Virginia, on May 1, 1944, and landed May 28 at Anzio and joined the 100th Battalion in Civitavecchia north of Rome on 10 June 1944, attached to the 34th Infantry Division. The unit continued in the push up Italy, now attached to the 88th Infantry Division, before joining the invasion of southern France, where the 442nd participated in the fight to liberate Bruyères, and was next attached to the 36th Infantry Division, originally a Texas National Guard outfit. The 442nd famously rescued the "Lost Battalion" at Biffontaine. Pursuant to army tradition of never leaving soldiers behind, over a five-day period, from October 26–30, 1944, the 442nd suffered the loss of nearly half of its roster—over 800 casualties, including 121 dead—while rescuing 211 members of the 36th Infantry Division's 1st Battalion, 141st Infantry, which had been surrounded by German forces in the Vosges mountains since October 24. Following the Vosges, the 442nd was sent to the Franco-Italian border on November 28 to relieve the soon-to-be-disbanded 1st Special Service Force. The 442nd remained there, refitting and training, until March 25, 1945, when it returned to the Fifth Army in Italy and was attached to the U.S. 92nd Infantry Division. On the Italian front, the 442nd had contact with another segregated American unit, the 92nd Infantry Division, as well as troops of the British and French colonial empires (West and East Africans, Moroccans, Algerians, Indians, Gurkhas, Jews from the Palestine mandated territory)and the non-segregated Brazilian Expeditionary Force which had in its ranks ethnic Japanese. The 442nd returned to heavy combat, seizing Monte Belvedere on April 7 and Carrara on April 10. The 522nd Field Artillery Battalion remained in northern France and joined the push into Germany in 1945. Scouts from the 522nd were among the first Allied troops to release prisoners from the Dachau concentration camp - or, more specifically, from one of its 169 sub-camps, where more than 3000 prisoners were held. The members of the 442, like all American veterans honored today, made the highest sacrifice to this country. More information on the 442nd can be found here. We thank them, and all American veterans, for their service.